Wilma E. Goad, age 101, of Burlington, passed away Wednesday, April 3, 2019 at Aurora Medical Center in Burlington. Born in Powers Lake, Wisconsin on February 21, 1918, she was the daughter of Herman and Martha (nee Lasch) Vogel. She spent her early life in Powers Lake where she graduated from area schools. On July 27, 1946 in Woodstock, Illinois she was united in marriage to James Goad. Wilma was a homemaker and former member of the United Methodist Church. 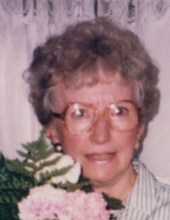 She helped raise her grandchildren and loved to play cards and do word games. She was a big football fan, especially for the Green Bay Packers, and always tuned into watch the political debates. Wilma is survived by her daughter, Sheila Naus; grandchildren, Matthew Thomas, Jason Thomas, Bradley Thomas, Joshua Thomas, Christopher Willich and Adam Willich; and great-grandchildren, Justin Thomas, Dylan Thomas, Oakleigh Davis, Gabriel Thomas, Wyatt Thomas, BriannaThomas and Cyrus Willich. She was preceded in death by her parents, husband, beloved daughter Diana Willich; sisters, Viola Webster, Eleanor Vogel and Ruby Peters; and brothers, Alvin Vogel and Walter Vogel. Per Wilma’s wishes, a private burial will take place at Burlington Cemetery. To send flowers or a remembrance gift to the family of Wilma E. Goad, please visit our Tribute Store. "Email Address" would like to share the life celebration of Wilma E. Goad. Click on the "link" to go to share a favorite memory or leave a condolence message for the family.